When shooting with your D7000, you have a choice of image formats that your camera will use to store the pictures on the memory card. JPEG is probably the format most familiar to anyone who has been using a digital camera. There is nothing wrong with JPEG if you are taking casual shots. JPEG files are ready to use, right out of the camera. Why go through the process of adjusting RAW images of the kids opening presents when you are just going to e-mail them to Grandma? Also, for journalists and sports photographers who are shooting nine frames per second and who need to transmit their images across the wire, again, JPEG is just fine. So what is wrong with JPEG? Absolutely nothing—unless you care about having complete creative control over all of your image data. JPEG is not actually an image format. It is a compression standard, and compression is where things go bad. When you have your camera set to JPEG—whether it is Fine, Normal, or Basic—you are telling the camera to process the image however it sees fit and then throw away enough image data to make it shrink into a smaller space. In doing so, you give up subtle image details that you will never get back in post-processing. That is an awfully simplified statement but still fairly accurate. So what does RAW have to offer? First and foremost, RAW images are like digital negatives and are typically not compressed. If they are compressed the camera uses lossless compression, which mean there is no loss of actual image data. Note that RAW image files will require you to perform post-processing on your photographs. This is not only necessary, it is the reason that most photographers use it. 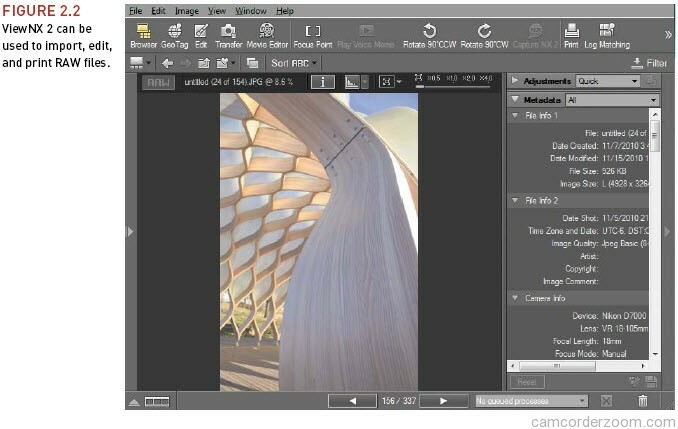 You can use the software that came with your camera to process the RAW images (Figure 2.2), or for more control you can use an application like Adobe Lightroom or Apple’s Aperture. I do all my own postproduction in Adobe Lightroom. RAW images have a greater dynamic range than JPEG-processed images. This means that you can recover image details that just aren’t available in JPEG-processed images. There is more color information in a RAW image because it is a 14-bit image, which means it contains more color information than a JPEG, which is almost always an 8-bit image. More color information means more to work with and smoother changes between tones. Regarding sharpening, a RAW image offers more control because you are the one who is applying the sharpening according to the effect you want to achieve. Once again, JPEG processing applies a standard amount of sharpening that you cannot change after the fact. Finally, and most importantly, a RAW file is your negative. The file format is called nondestructive. Meaning, no matter what you do to it, you won’t change it unless you save your file in a different format. This means that you can come back to that RAW file later and try different processing settings to achieve other results and never harm the original image. By comparison, if you make a change to your JPEG and accidentally save the file, guess what? You have a new original file, and you will never get back to that first image. That alone should make you sit up and take notice. Don’t give up on shooting RAW just because it means more work. Hey, if it takes up more space on your card, buy bigger cards or more smaller ones. Will it take more time to download? Yes, but good things come to those who wait. Don’t worry about needing to purchase expensive software to work with your RAW files; you already own a program that will allow you to work with them. Nikon’s ViewNX 2 software comes bundled in the box with your camera and gives you the ability to work directly on the RAW files and then output the enhanced results. 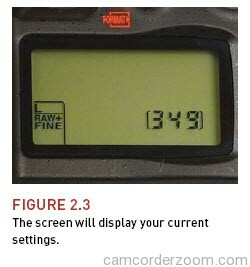 If you’re unfamiliar with RAW format, my recommendation is to shoot in JPEG mode while you are using this book. This will allow you to quickly review your images and study the effects of the book’s lessons. Once you have become comfortable with all of the camera features, you should switch to shooting in RAW mode so that you can start gaining more creative control over your image processing. After all, you took the photograph—shouldn’t you be the one to decide how it looks in the end? When photographers are discussing digital cameras, the term image resolution is often used to describe pixel resolution or the number of pixels used to make an image. This can be displayed as a dimension such as 4928 x 3264. This is the physical number of pixels in width and height of the image sensor. Resolution can also be referred to in megapixels (MP) such as 19.4 MP for a RAW 14-bit lossless compression. This number represents the number of total pixels on the sensor and is commonly used to describe the amount of image data that a digital camera can capture. Your camera has the added benefit of being able to write two files for each picture you take, one in RAW and one in JPEG. This can be useful if you need a quick version to e-mail but want a higher-quality version for more advanced processing. 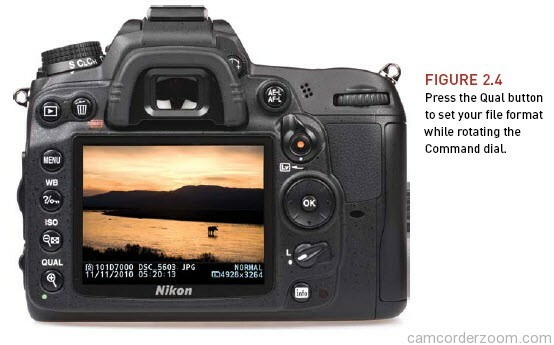 You will notice that there is a dash (—) option at the beginning of the RAW and JPEG settings. If you don’t want to shoot in both RAW and JPEG together, you must set one of the formats to the dash. If you have a RAW and JPEG setting selected, your camera will save your images in both formats on your card. you’re unfamiliar with it and still have the security blanket of JPEG. You can also see the difference between the two and decide for yourself which file type you prefer. However, eventually I recommend that you use only one format or the other unless you have a specific need to shoot both. dial with your right thumb until it shows RAW+Fine, RAW+Norm, or RAW+Basic (Figure 2.4). You can then choose the size of the JPEG file by holding the Qual button and rotating the Sub-command dial with your right finger to choose S, M, or L for small, medium, or large JPEG (Figure 2.5). Release the Qual button to make your final selection. To choose one memory card to record JPEG and the other RAW, press the Menu button on the back of the camera. Use the Multi-selector to choose the Shooting menu (A). Select the option Role Played by Card in Slot 2 and press OK (B). 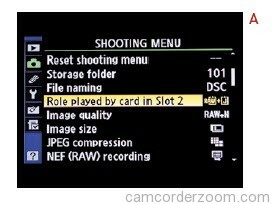 Using the Multi-selector, choose RAW Slot 1 – JPEG Slot 2, and press OK to finalize your selection (C). You will notice when you are in the selection screen on the top LCD of the camera that you will be able to see how much storage space each option will require on your SD card. This is the number to the right of the screen. The RAW+Fine L option, which is the one I use, will take up approximately 23 MB of space for each photograph you take.